Not long ago we reported that Microsoft designed some specialized kiosks with an Xbox 360 into hospitals and now Nintendo is doing the same thing with the Wii. I’m a little surprised that Nintendo is falling behind Microsoft in this regard since MS had something setup first but I’m sure that a lot of hospitals have had Wii’s setup in an ‘unofficial’ manner for kids to play for sometime now. Either way it’s great that kids get to do something to take their minds off of the situation that they are facing. So this can lead us again to wonder when someone will try out something like this but with a coin box attached. I have noticed that most of the attempts to bring a game console to the coin-op arena have been focusing on the 360 instead of the Wii which arguably is the more popular system. Perhaps Nintendo’s famous track record of lawsuits and pwnage in the courts deters people from trying although I would think that the same would happen with Microsoft or Sony. Unless the companies undertake the effort to do it themselves I have doubts that they’ll let another company setup their product as a coin-op arcade machine. 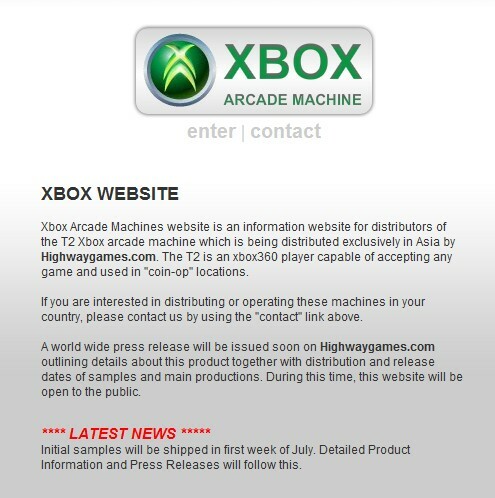 Speaking of the Xbox Arcade Machine I posted about yesterday, it looks like it’s not ready to go just yet (surprise!) although the website for the machine changed but that isn’t saying much. From their news it will be showing up in Asia in the first week of July and then they will send out press releases. Like usual nothing extraordinary happens when the countdown timer reaches zero so we’ll have to still wait and see what happens next week. To the right is an image of the change to the website, or you can witness it with your own browser here. Nintendo actually wasn’t behind Microsoft on this. As a representative of Starlight Starbright Children’s Foundation, I know that Nintendo has been placing Fun Centers in hospitals since 1992. There are more than 5,000 Fun Centers in more than 1,000 hospitals in the US and Canada. Nintendo includes their latest gaming system in each generation of the Fun Center – so this is just the news announcing that the new Fun Center model now includes the Wii. Sorry, I wasn’t clear about it so I modified my post. I meant to say that Nintendo was lagging behind Microsoft in that MS had this sort of thing setup in hospitals before Nintendo did with their latest game system – I had expected the Wii to have replaced any sort of GameCube kiosk some time ago. Sorry about the confusion and thanks for pointing that out. Not at all! I appreciate you updating the post! Thanks.